Foreigners competing in Korea goes all the way back to the dawn of professional StarCraft. Capturing the competitive spirit of people the world over, several foreigners would take the plunge and travel to the competitive frontier of Korea. With hopes, dreams, and ambition in hand, they sought to make a name for themselves. Players like Elky and Grrr... to Idra and Ret competed with the very best regardless of any barriers, all for the love of the game. Even in today's bygone era, there still remains an echoing sentiment in foreign players. In the unique age of entertainment, live streaming personalities, and prominent female personalities in the StarCraft scene, Scottish Zerg Cadenzie has found novel success as a foreigner in the post-Kespa landscape. In her year and more of living in Korea, she won Lady AfreecaTV StarLeague (LASL) against defending champion Aegong and helped her team—which included Last, Jaedong, and Tyson—win BJ Destruction Season 2. Hello Cadenzie, thank you for giving TL this opportunity to interview you. To begin, please introduce yourself for the readers. Hi everyone, I'm Zoe "Cadenzie" Summers, a Zerg player from Scotland. For our first question, what do you think of Korea so far? Do the people or culture stand out to you in any particular way? The main thing I find different about Koreans is that they are always doing something and they always have plans. I'm used to taking time off here and there and just kind of doing whatever each day without much thought, which is apparently crazy talk here. Yes, Koreans have a very hardworking culture. Do you see that stress and dedication in the progamers and fellow streamers? Everyone has so much pressure on them to do well, so they work pretty much around the clock giving it their all. I've seen people push hard all the way to their breaking point practicing for tournaments, and people often talk to me about the pressure from their teammates and their own expectations to do well. It even became a bit contagious, and I felt a tonne of pressure too; before several tournaments I practiced harder than ever because I felt like there was certain expectations for me to win. I've heard often that people barely sleep long at all, often just a handful of hours...if that. It seems like Koreans really do dedicate everything into what they do. I often find myself struggling to keep up with their incredible work ethic. That is intense. How exactly do you practice for these tournaments and how much do you practice on an average day? When I'm practicing for a tournament, I'll typically ask an ex-pro to make some builds for me and explain the variations of the build based on scouting information. Just going through this part of the process a long takes a few hours, per build, watching games and replays and listening to the thought process behind each adjustment. I'll also have a practice partner scheduled for the day, sometimes another female player, or sometimes my "연도기" as they call it here...basically "practice partner". I pretty much just spend the entire day preparing with a mixture of practicing the opening vs AI, watching the replays, messaging progamers asking them questions about the builds, and actually playing. I also mix in a few ladder games before playing just to warm up...so it depends only on how long I sleep and eat... maybe sometimes in the past I've practiced like 14hours in some days ^^. Recently I haven't been able to do that because I had lasik surgery and I don't want to stress my eyes like that until fully healed. 14 hours, that sounds brutal. Gaming every waking hour seems fun, but it seems like it quickly wears off. Is the game still "fun" to you? How has your attitude changed since you're now playing it competitively? I do often have thoughts like, “Is this too much? Should I take a break? Am I risking injury?” Whenever I play for that long...and maybe I was at risk of burning out to the point of quitting a few times. Sometimes the game doesn’t feel so enjoyable, and I take a bit of a break, but then a new tournament shows up and I feel different again. Whenever there is a tournament here to practice for, I feel like I want to try my best. It's also pretty awesome getting help from the ex-pros here, so that takes a lot of the weight off for sure. Also since my playing reduced a lot recently, it doesn't really feel so bad and I can have more fun. What would you say has been the most exciting moment in your StarCraft career? I think during the first BJ Destruction Season 1 tournament when I had lost my set and we were playing the 생컨 (micro/macro) set was probably the most exciting moment still. I was the micro player, and Effort was macroing for our team, and it seemed like we were about to lose, but I managed to sneak two zerglings in to kill several drones during the muta/scourge fight. We managed to even out the score from that again for Effort to win the ace set for us. It sort of felt like a weird mix between defeat and victory and remains very memorable since it was also my first time playing on stage. Speaking of competing, what's the next event you'll participate in and what's the best part of it? There's an "animal tier" tournament coming up soon where I play as Terran because there’s a sponbbang elo cap of 1300 for it, and I have over 1800 on my Zerg. But I'm allowed to play Terran because I'm just that bad at offracing. I'm more looking forward to LASL in March though since I'm the reigning champion. I'll even get the rigging-brackets seed spot, so that should be a lot of fun in group selection. I think I'm actually looking forward to group selection more than actually playing. In terms of StarCraft strategy and tactics, how large of a gap in understanding is there between Koreans and foreigners? Where do you think foreigner StarCraft lacks compared to Korean StarCraft? Foreigners generally have good control and one or two builds/styles that they’ve practiced a tonne, but I can tell now after learning a lot of stuff here they don’t really understand scouting and altering their build path anywhere close to Korean level. Basic stuff like correct drone distribution is often a big mistake in foreigner play and was definitely a huge weakness of mine in the past. Just the early game economy management and timings are something foreigners often do massively wrong, which spirals their build out of control. And then rely on all sorts of weird gimmicks to get them back in the game instead of fixing their overall underlying problems. I think the most important point is early game build optimizations. If your foundation for your play isn’t perfect, then everything will be thrown off and you’ll start making more and more mistakes and relying on control to make up for simple shortcomings in economy. So yea...early game optimizations and scouting/adapting are the most lacking. Darn, that's pretty big. Do you think you could possibly be the top foreigner by the time this is all said and done? I think I'm probably too slow to have potential that great, and my stamina isn't good at all. I'm definitely bottlenecked in that regard. I would have to work on multitasking and staying fast as the game goes longer a considerable amount. Let's back up a second and talk about your trip to Korea. How long has it been since you first arrived? The last time I left my home country to come here—I believe it was 26th June—so that is quite a long time…. I'm actually visiting home in a few weeks for about 12 days though, so I'll finally be able to see home again ^-^. That's great news. Being away for months at a time from Scotland, you must've felt homesick. How exactly did you cope? I actually got pretty homesick a few times, but all my great friends here have helped me through it, even trying to find all sorts of UK restaurants to take me to and make me feel at home. It has been pretty emotional, but I'm happy to have people here to help me through it and listen to all my struggles. Just talking about struggles helps so much. When you first moved to Korea, there must've been a lot going on. How did your family react when you said you were going to travel to Korea to be a professional streamer/StarCraft player? Did they understand what it was about and the full magnitude of the scene? When I came to Korea, it was very short notice. Basically, Rain had asked me to join his team for an event happening in a couple of weeks...and I had to arrive in Korea basically right away so we could prepare for it. My family were pretty shocked but also amazed that I was leaving to Korea suddenly in like two days. I can't imagine how they must have felt about it really, but they've been supportive and knew it was a cool opportunity for me. My mum doesn't really know much about the scene other than watching my stream a few times, but my sister understands a lot more. I can't wait to see them again and talk about it almost a year of things we missed in each other’s lives. They have a lot to catch up on. When you landed in Korea, it must've be a little surreal to be just a random person in Scotland to a celebrity streamer in Korea. Yeah, it was absolutely crazy. The first few times I had people recognise me on the street, in restaurants, pc bangs, subways, it was like some sort of weird set-up for a prank almost in my mind. I didn't expect to be so recognisable just traveling around Korea. When I go to events just to watch, such as ASL, I get a queue of people wanting to take a picture with me and such. It's pretty weird to be famous in one country on the other side of the world. I imagine I'll go home and not a single person will know who I am...that sounds very relaxing actually ^^. Going back a bit, let's talk about Rain asking you to join his team. What made you decide to pursue competing in StarCraft in Korea? I had actually just gotten back from a 3 week holiday in Korea, and I was kind of still itching to go back anyway, so this was almost just the excuse I needed to justify going back to myself. I had also been making friends with a few of the ex-pros, so it actually felt like I had a lot of friends in Korea. Also, Britney offered to get me a hotel room near his streaming house, so it actually felt pretty comfortable to go. We saw some funny interactions between you and Miso/Piano when you were in Scotland, and it seems that a lot of people have gotten to know you now. Have you become close to any of the Korean progamers? It has been really awesome getting to know all the ex-pros. Recently, I've become really good friends with tossgirl. We meet sometimes for food and just talk a lot. She has also been helping me out learning some Korean. I've also been close with Shine because his English is good enough that we can communicate easily, and I learned so much Zerg stuff from him—even if I don't always put it into practice. Pretty much all of the ex-pros, I've eaten with and interacted with in some way, and everyone says hi to me at events. It's always really great when Larva comes to talk to me; his English is adorable, and he makes me laugh uncontrollably. The language barrier must be tough. Have there been any frustrating or funny moments because of it? It's always a bit awkward when I hang out with people with minimal English ability, especially if we're streaming...then the awkwardness can be pretty intense. Even if one person there speaks English, it’s hard for them to translate everything everyone says, so the conversation flow isn't there at all. Even if I know a decent amount of Korean words, conversational language is so difficult to follow. I don't mind too much though. I just try to absorb as much Korean as I can and listen a lot because my pronunciation is awful, so I can learn a lot from just listening to how they say things. Often people will think im saying something completely different to what I mean, so awkward situations do appear often and it’s hard for me to explain my true intentions. I've unintentionally insulted people a few times actually. Wow, that must be tough. Your Korean seems to be improving a lot though. Do you do anything to help practice and learn Korean? I have a few friends here who teach me new Korean words here and there, and also tell me to ask them any time I have a question. doomi, duksun, narism and tossgirl have all recently taught me Korean words and even explained the pronunciation. It's extremely difficult though...I have some books and audio files too but I don't look at them very often, usually I just bombard Jisoo with my questions of how to say this or that, but she’s always happy to help, so it’s really nice. What is your favorite Korean food so far? I had 치즈 달갈비 (melted cheese with chiken cooked in some sort of sauce) with Shine that was actually really good. Also, the stew pot thing I had with zelot was pretty nice, but I forgot its name. Usually it's pretty hard for me to handle the spicy levels in Korean food though...Indian curry in the UK doesn't compare to it at all, or maybe it’s just a different kind of spicy. Korean BBQ is kind of hit or miss for me. Either it’s too chewy or really good. Wow, you met with Zelot...I'm envious. Zelot is a pretty awesome guy. We'll ask about guys like Zelot a bit later. What do you think of the taste of soju? I think soju is easier to drink than vodka or whisky, but it doesn't have anything nice to its taste unflavoured. What are your favorite places to go to in Korea? My favourite is going to the top of Lotte tower (Seoul Sky Tower?) and just watching the sunset. I've been there a few times now, and I think I'll probably go back for a few more. I also really love the beaches in the summer, but right now it's too cold. As a competitor in Korea, you have the privilege of meeting a lot of different ex-pros. Do you ever get chills when you meet them? Some of these guys level of understanding and play is unparalleled among even other ex-pros...they've won multiple MSLs and OSLs, have thousands of fans, and have spent so many hours, and blood, sweat, and tears into this. Is there ever that astonishment or aura you get from these guys? Any other amateurs you know of? Eros_Byul, soma, noob, etc? I don’t really know byul or noob other than when we played, but soma has helped me before with learning ZvT, and I met him at the qualifiers. Rewind back to being in Scotland, and you get a chance to do this all over again. What would you do differently, if anything? I think maybe I would have focused on Korean study a bit more than StarCraft actually. Trading some of my StarCraft ability for better communication is a trade I would easily make actually. It's very far off, but have you ever thought of what you're going to do after your visit to Korea is over? I'm the type of person who never really plans anything. I'll probably just follow my interests at the time. If I can learn a lot of Korean maybe teaching, translating or something could be cool...but who knows what I'll do next. On the future of the progaming scene, you must have noticed that ASL7 is the first ever tournament that none of TaekBangLeeSsang have participated in. This really is the ending of an era in a sense. Do you think the competitive StarCraft scene will continue as it is today? What do you think the future will look like if you had any predictions? It's hard to know how the StarCraft scene will go because it’s entirely built on the backs of the fans. As long as there are fans supporting it, then it will do just fine. With Zero’s recent return and Bisu coming back soon, I think there should still be a lot of fan interest for a while yet. Also, with the stepping back of some of the higher level players, it does open the door to the strong amateurs to make a name for themselves too, which can be very interesting for the viewers. I want to thank you for doing this interview and giving your time. Do you have any shoutouts for your friends or family? Great interview! Cadenzie really is living the dream! Nice interview, thanks for doing it! Interesting thing to get to experience. I didn't realize she was so popular on afreeca that she gets recognized on the street, that's amazing. Good job Cadenzie and thanks for the interview. Enjoyed it. Yeah, the idea about focusing more on the language in lieu of more skill makes a lot of sense. Probably that would equate to better skill in the long run too just because of more efficient learning. are those real ray bans or knockoffs? your sunglasses go really well w/ your leopard shirt, very stylish.. I feel like some UK player just got offended. The real question not asked: What's up with the soft stuffed squeeky voiced giraffe? Can we get an audio version too? Im not much of a reader. Great interview! Good luck denzie. Lovely interview, thanks for this. 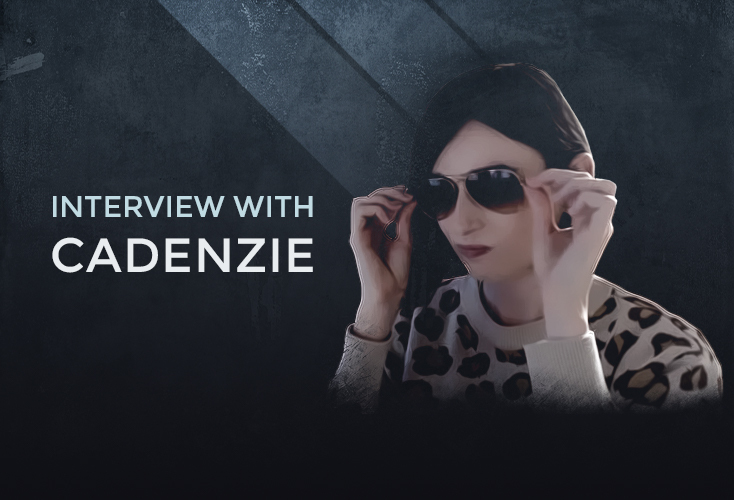 I wish you the best of luck in the up-coming events, Cadenzie :D.
Awesome interview. Best of luck! Nice interview. Good luck Cadenzie!